……for a very important date!! Yes, it’s the White Rabbit in Alice in Wonderland. And isn’t it an excellent saying for a belated birthday card! The Stampin’ Up! 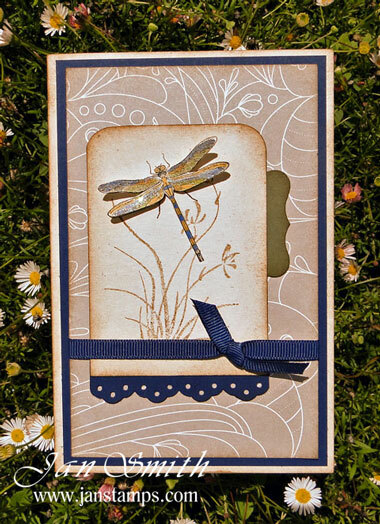 product list is Loveletter dsp, Rich Razzleberry cardstock and grosgrain, Natural Ivory cardstock and Very Vanilla. The card base and main background paper are from my Club Scrap stash. 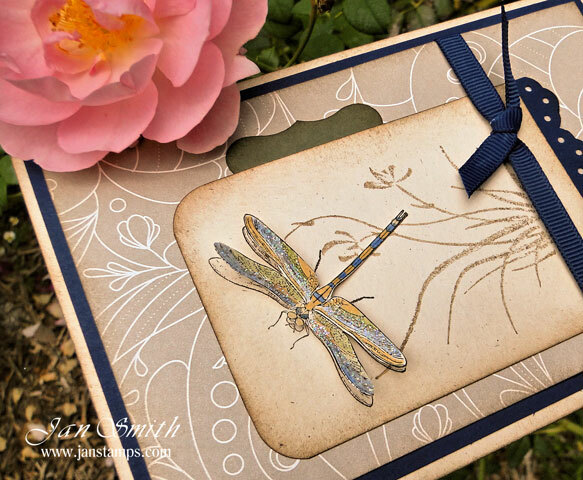 Inkpads used in sponging were Tim Holtz Distress Ink Tea Dye and SU Early Espresso – it’s a great combo to use together – each softens the other. 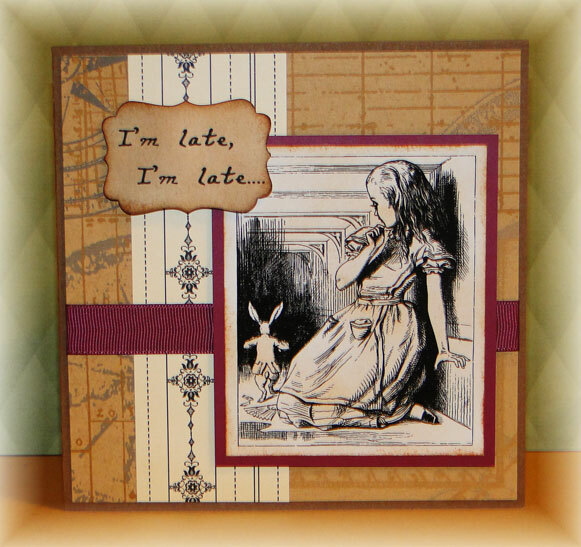 The digital image, from Tricia Curtis Designs, is printed on Epson Heavy Matte and the font is called Lewis Carroll. I was tickled pink to find that font! 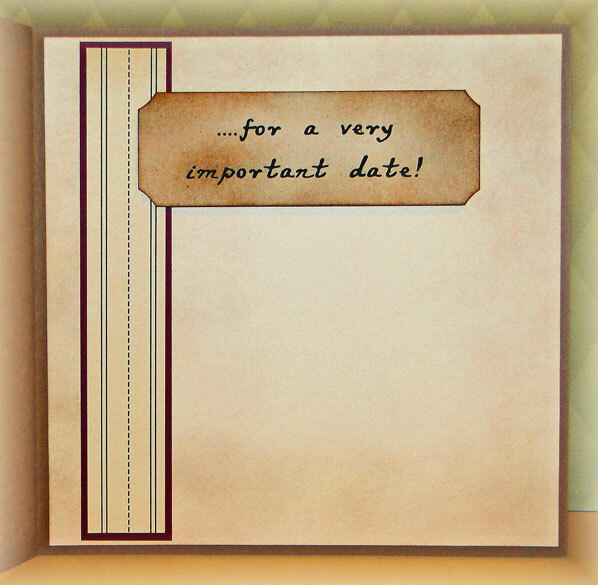 Make a belated card today! And then you’ll be ready for when you’re late!! Here we are again at the JAI Challenge! I love these colours!!! My idea was for a card with very simple, clean lines. 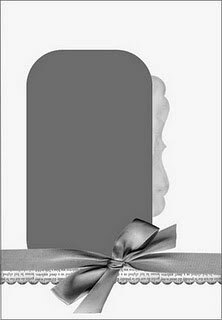 The card is 6×3 when folded. This is certainly a great colour combo and I urge you to give it a try. Very elegant colours when combined. 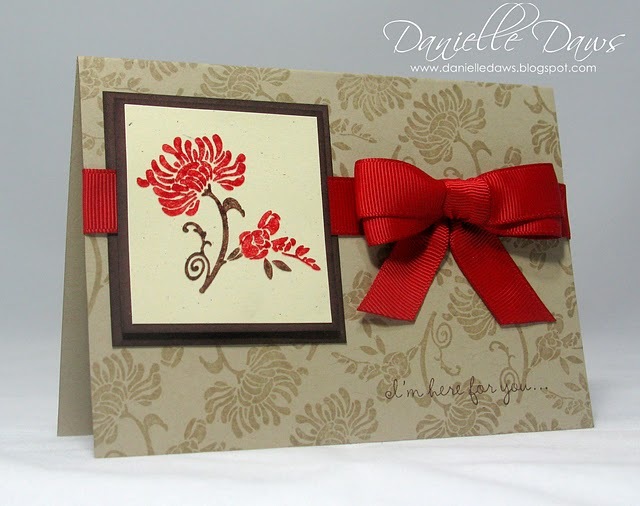 Part 2 of the Just Add Ink challenge, and this one is for Danielle, Queen of Ribbons and Bows and Stamp-A-Ma-Jigs!! This is a friendly union of browns – Soft Suede meets Chocolate Chip meets Early Espresso. And a little Regal Rose for the blossom. The background card is Very Vanilla. And yes, I did use my Stamp-A-Ma-Jig to get the border just right. And yes, I did use my Stamp-A-Ma-Jig to stamp the Note of Thanks ……… and totally fluffed it ……..and had to resort to a punched greeting to cover the damage! But I think it all ended well! Danielle, thanks for your efforts and inspiration! Hi there! I’m playing along in the Just Add Ink challenge for this week. 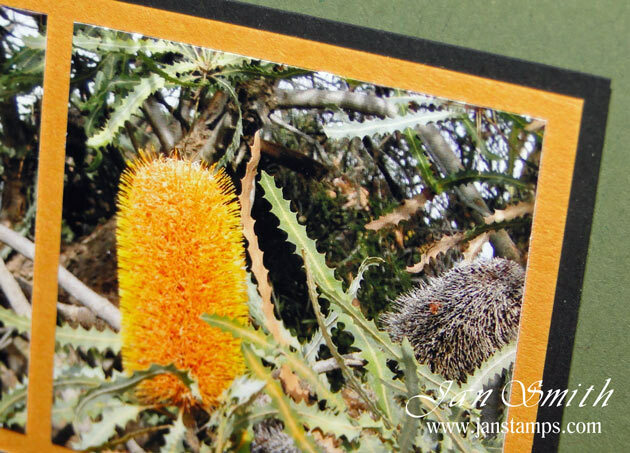 This post is a Part 1 of 2 and it’s my post for Amanda Reddicliffe, photographer extraordinaire. This is Always Artichoke cardstock for the background, a strip of Greenhouse Gala DSP and the photo is mounted on More Mustard and Basic Black. 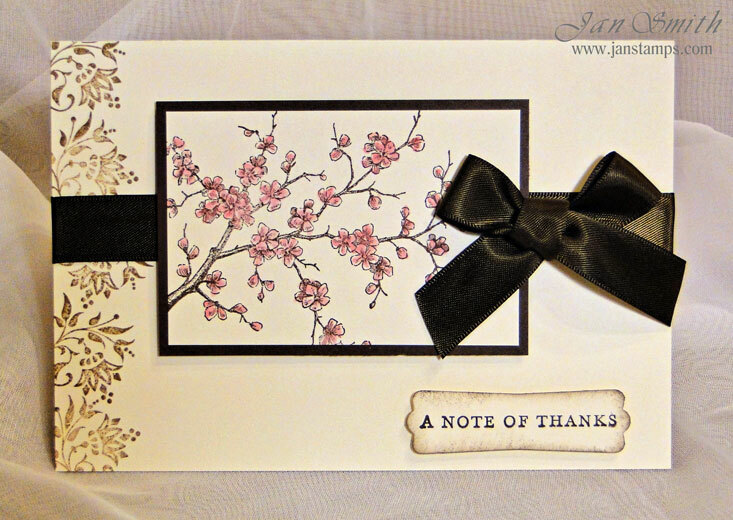 The sentiment is from the Thank You Kindly stamp set. 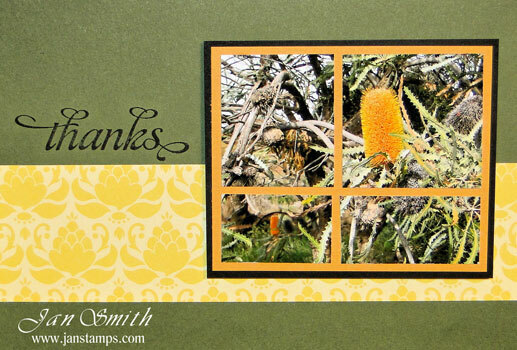 I love how the motif on the dsp compliments the Banksia. Amanda, thanks for all your effort and inspiration. 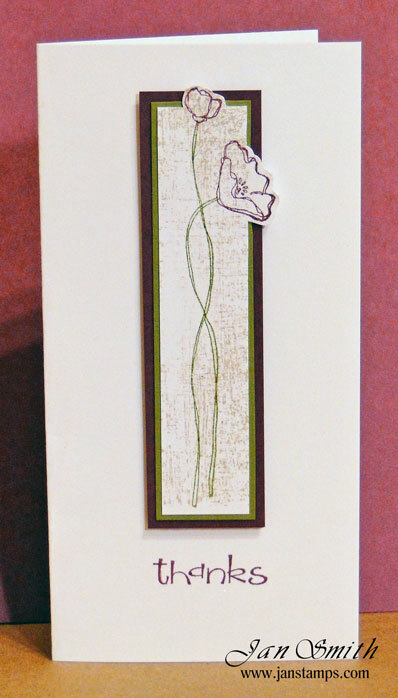 The front of this card is made using a fun technique explained by Linda Heller in this week’s Stamping School. kit gives this wonderful white-wash effect. 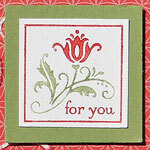 This little greeting comes from the Cute by the Inch stamp set (currently a Hostess gift). 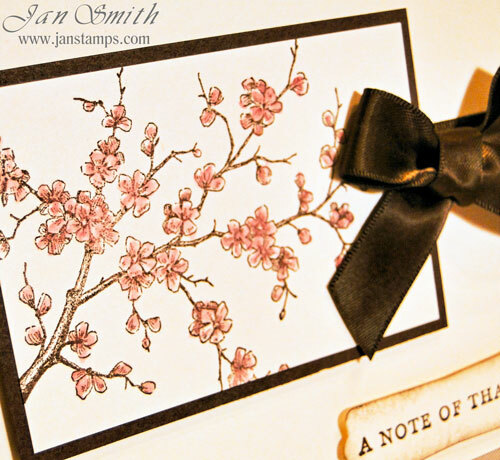 I coloured the stamp with SU Markers – Poppy Parade and Pear Pizzazz. 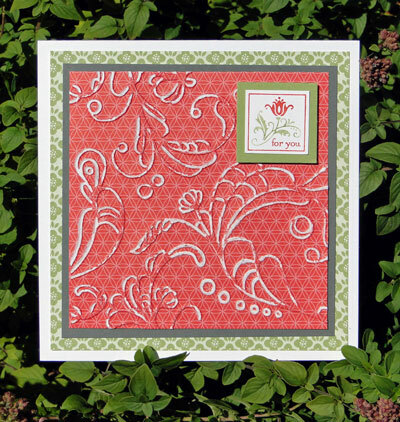 And I photographed the card in our oregano patch as the unopened oregano blooms are reminiscent of these stamps. The latest challenge at Just Add Ink is a delightful sketch. 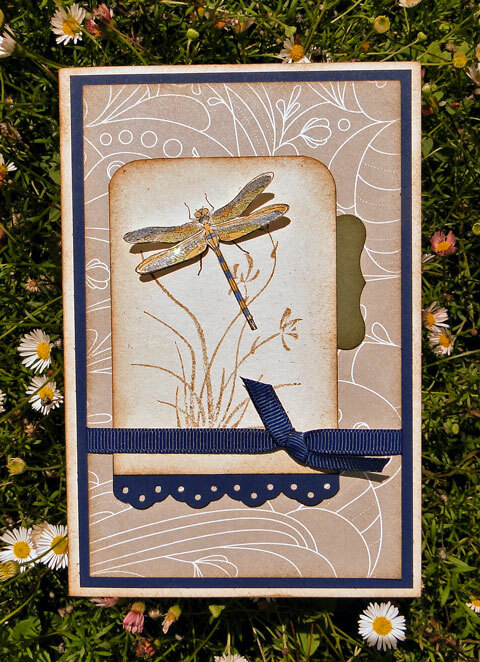 I’ve chosen the dragonfly from the Nature’s Nest stamp set. He’s so much fun to colour and of course he needed Dazzling Diamond wings! Has such a fearful name. That was nearly half as tame. happiness given back and forth. 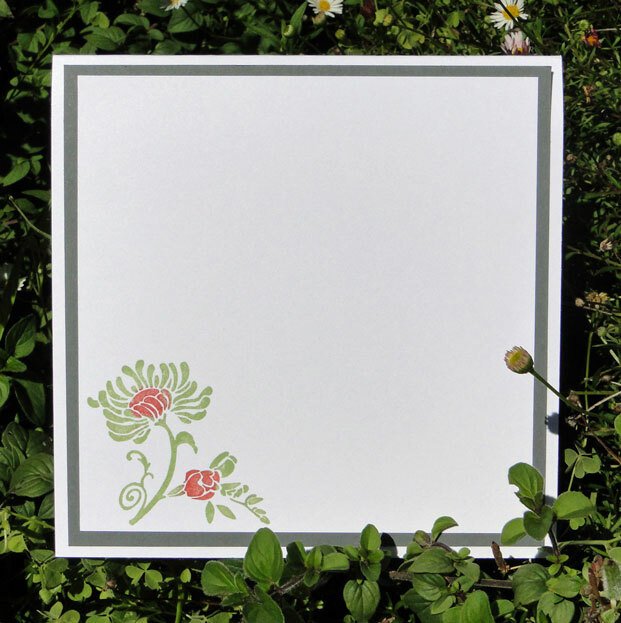 And this card is a happy celebration of love, with it’s bright and cheerful colours. This is my card for the Just Add Ink challenge. Our brief this week, “Just Add Love”. 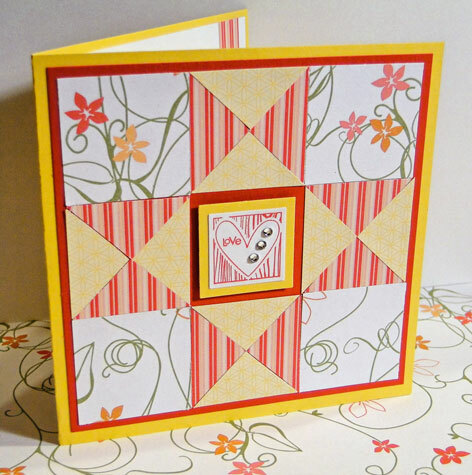 I have used the Quilted Card idea from this Wednesday’s Tutorial at Splitcoast Stampers. 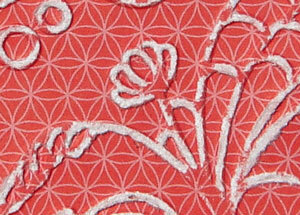 The quilt pattern on my card is known in quilting circles as Variable Star. It’s wonderfully easy. Just punch 4 squares of one dsp and leave whole, and punch 4 squares of another dsp and cut them diagonally to form 4 triangles from each square. Then simply arrange on your card mat. Pop a little embellishment in the centre. I was pleasantly surprised by the Sunny Garden dsp in this card. 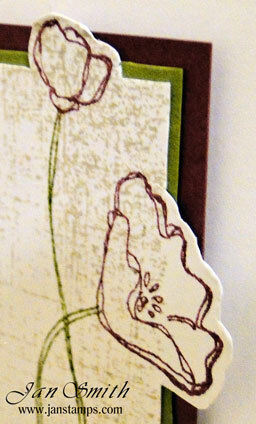 I have found this paper set rather confronting – that Poppy Parade is soooooo bright! It’s a very neon, smack you in the eye, red orange colour! But what a surprise to find that when used in small doses it is very appealing. And those stripes on the dsp are perfect for a quilt design. This card could be given any day of the year I think, not just for Valentine’s Day. Changes are afoot at Just Add Ink, so thanks to Danielle and Amanda for all their efforts in providing JAI fun for everyone. I’m only new to JAI challenges, so I’m delighted to know that it will continue under the auspices of Delys and Bronwyn. Thanks to all of you! And thanks to you for making the journey to my blog. I wish you love and all the happiness that goes with it! 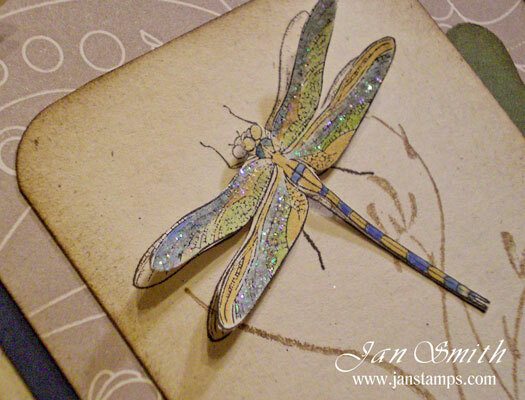 What a fun challenge over at Just Add Ink this week! These colours say Valentines Day to me, so out with my little owl stamp and punch. 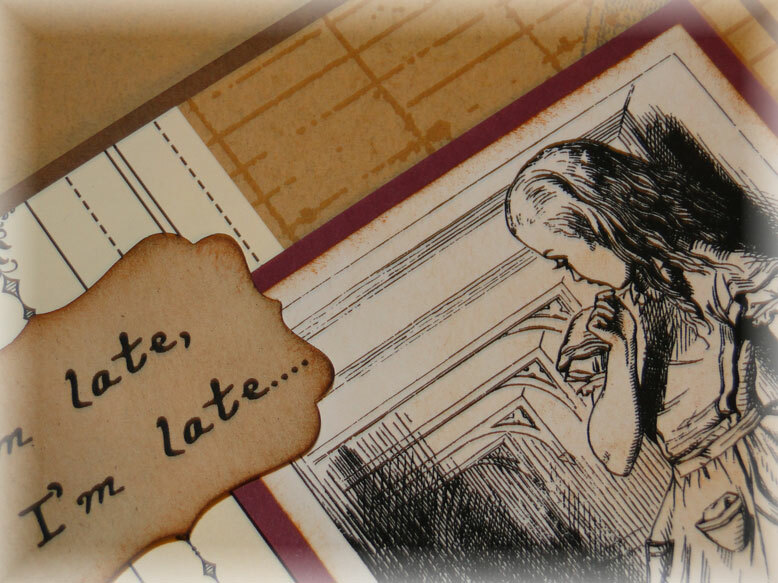 The card front has pleated ribbon and the owl and thought bubble are on dimensionals. Here is the inside of the card. The little owl is meant to be winking, but I rather fear it just looks like an owl with a seriously bad eye problem! Chelsea, our daughter, has taken a shine to our little owl friends while I was making them, so the card is destined for her for Valentine’s Day. So shhhh…. and I hope she doesn’t come visiting my blog. I shall have to lay low! Thank you so much for looking and sharing in my little bit of “owl-y” fun!